The new multifunctional Kostal PIKO IQ 10 3ph 10kW Solar Inverter has something in its heads, or better in the box. In addition to a completely new design, the interior was revised. This created a separate connection space for all interfaces. And those can only be described as complete at the Kostal Piko IQ. 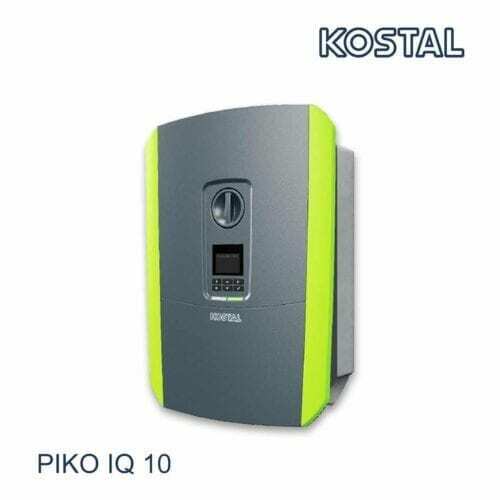 The Kostal PIKO IQ 10 3ph 10kW Solar Inverter has continuous self-consumption measurement, dynamic power control, intelligent shadow management and the proven free Kostal portal are on board. The integrated web server also makes local use possible. KOSTAL Solar Electric GmbH with its headquarters in Germany produces quality inverters and storage systems for the international photovoltaic market. The company relies on more than 100 years of professional knowledge and the strong community of the KOSTAL group. Inspired by the “zero-defect philosophy“ of the automotive supplier branch, KOSTAL Solar Electric pursues highest quality standards. Those pervade every functional area from product development to production, following highest technical standards at the KOSTAL Industrie Elektrik in Hagen, Germany, as well as the distribution and service performance from KOSTAL Solar Electric in Freiburg, Germany. The PIKO-inverter from KOSTAL is particularly appreciated, because functions, which usually are fee-based, are integrated standardly. Join our ZERO Home Bills Community. BEST Products from the BEST Brands at the BEST Prices for ZERO Home Bills on ZEROhomebills.com by Solaranna.